Adjust the seat so that when the handles are grasped your upper arms are parallel with the ground, i.e. the angle of your elbow joints is 90 degrees. Note that once you are seated and in position, your arms should be open with your elbows out to the sides; if not contraindicated (by previous injury or pain), it is preferable that the handles are set in such a position that your chest receives a stretch when in the extended starting position (with your elbows out and back). Sit with your feet planted and grasp the handles (if handles are present). Your forearms should be pressed against the pads. Squeeze your arms together, exhaling throughout the movement. Once your arms meet in front of your face, you may isometrically contract your chest muscles to ensure that full inner chest muscular recruitment is achieved. Allow your arms to move apart and back, inhaling throughout the movement. Best outer chest muscular recruitment occurs when the weight pulls your arms all the way back, thus stretching your chest fully. Only allow such a stretch if it is comfortable to do so. As noted above, it is when the arms are together in front of your face that the inner chest (sternal head) is most optimally contracted. If your aim is to work the inner aspect of the chest, then pay extra attention to the squeeze at the very end of the positive motion (where the arms meet in front of your face). Isometrically contract your chest muscles to achieve full sternal head muscular recruitment, i.e. hold the squeeze even when your arms can move no more (because they have already met in front of you). The fully-stretched, back (extended) aspect of the motion is where the outer chest is most optimally contracted. If your aim is to work the outer aspect of the chest, then pay extra attention to the stretch at the very end of the negative motion (where the arms are back). Pec deck flys work the pectoralis major muscles (i.e. the main, large chest muscles), to include both the sternal head (i.e. inner aspect) and the clavicular head (i.e. primarily the upper aspect of the chest, but also the upper-outer aspect). In addition to working the pectorals, this exercise works the coracobrachialis and the short head of the biceps. The negative aspect (when the arms are outstretched to the sides and back) is conventionally considered a hazardous aspect of any sort of fly exercise and this is no different for pec deck flys. 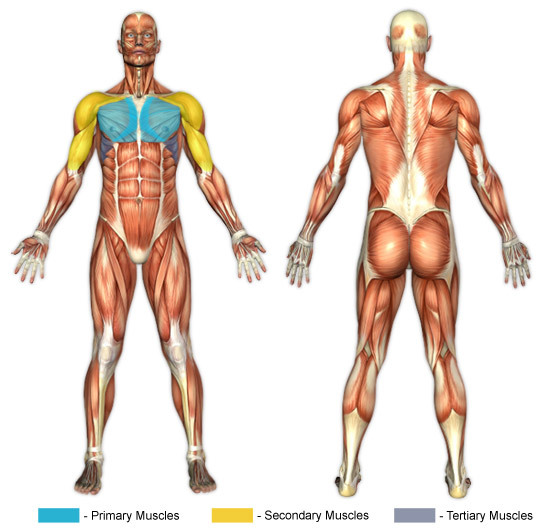 When the arms are outstretched to the sides and back, tremendous stress is put on the anterior shoulders and pectorals, especially with heavy weight usage. Biceps injuries, though far less common, do also occur with flys. As a general rule, if not familiar with flys or if pain is felt, use good judgment and only use weight amounts that you are comfortable with. Also, do not feel obligated to fully stretch your pectorals with this exercise.